Located just outside the center of Nassau, SLS Baha Mar is a short 15-minute drive to Lynden Pindling International Airport. SLS style meets an exotic new locale at SLS Baha Mar. Stop a while on the Bahamian Riviera and see what all the fuss is about. 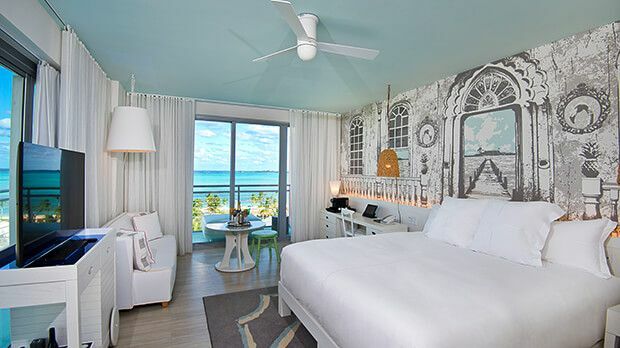 Poised just outside the center of Nassau, SLS Baha Mar offers 299 luxurious accommodations for guests. All are adorned with SLS signature bedding as standard, custom Ciel Spa bath amenities and bathrooms with walk-in rainfall showers. Entertainment options abound at this stylish resort, with a choice of top-notch restaurants for dining and imbibing, and 30 different retail outlets in which to engage in a little retail therapy. If shopping proves too taxing, retreat to the picturesque white sand beach for a little old-fashioned relaxation. Given the local climate, it's no surprise golfing is a major activity at SLS Baha Mar. Designed by 18-time Major Championship winner Jack Nicklaus, the Royal Blue Baha Mar offers 18-holes of championship-level play against a picturesque backdrop. Baha Mar also provides the perfect landing point for gaming fans with the presence of the Caribbean's largest casino. Guests can enjoy over 18 different table games, 1,100 slot machines and poolside gaming at The Cabana Club. Send an availability request with your requested dates to the SLS Baha Mar. Features one Signature SLS King bed, step-out balcony, 42" HD TV, Ciel Reserve amenities and minibar curated with SLS Signature items. Features two Signature SLS Queen beds, step-out balcony, 42" HD TV, Ciel Reserve amenities and minibar curated with SLS Signature items. Features one Signature SLS King bed, breathtaking ocean views, step-out balcony, 42" HD TV, Ciel Reserve amenities and a minibar curated with SLS Signature items. Features one Signature SLS King bed, breathtaking ocean views, full balcony, 42" HD TV, Ciel Reserve amenities and a minibar curated with SLS Signature items. Features two Signature SLS Queen beds, breathtaking ocean views, step-out balcony, 42" HD TV, Ciel Reserve amenities and minibar curated with SLS Signature items. Features one Signature SLS King bed, breathtaking ocean views, two step-out balconies, seating area with sofa and coffee table, 55" HD TV, Ciel Reserve amenities and minibar curated with SLS Signature items. Features one Signature SLS King bed, two step-out balconies, seating area with sofa and coffee table, 55" HD TV, Ciel Reserve amenities and minibar curated with SLS Signature items. Features one Signature SLS King bed, sweeping ocean views, step-out balcony, seating area with sofa and coffee table, 55" HD TV, designer kitchenette, Ciel Reserve amenities and minibar curated with SLS Signature items. Features one Signature SLS King bed, breathtaking ocean views, full balcony, seating area with sofa and coffee table, 55" HD TV, Ciel Reserve amenities and minibar curated with SLS Signature items. Features one Signature SLS King bed, sweeping ocean views, full balcony, seating area with sofa and coffee table, 55" HD TV, designer kitchenette, Ciel Reserve amenities and minibar curated with SLS Signature items. Features one Signature SLS King bed with full ensuite bathroom, two Signature SLS Queen beds with full bathroom, three full or Juliette balconies, separate living room with enhanced seating, 55" HD TV, designer kitchenette, Ciel Reserve amenities and minibar curated with SLS Signature items. Features one Signature SLS King bed with full ensuite bathroom, two Signature SLS Queen beds with full bathroom, sweeping ocean views, three full or Juliette balconies, separate living room with enhanced seating, 55" HD TV, designer kitchenette, Ciel Reserve amenities and minibar curated with SLS Signature items. Features one Signature SLS King bed with full ensuite bathroom, two Signature SLS Queen beds with full bathroom, sweeping ocean views, three full or Juliette balconies, separate living room with enhanced seating with 55" HD TV, designer kitchenette, Ciel Reserve amenities and a minibar curated with SLS Signature items. Features one Signature SLS King bed with full ensuite bathroom, sweeping resort views, separate dressing room, separate living room with enhanced seating, 55" HD TV, designer kitchenette, Ciel Reserve amenities and minibar curated with SLS Signature items.